Solar trackers are usually singly supported slender constructions with large platform on which solar cells for production of electricity are mounted. Sun tracker structure must mainly bear its own weight, snow loading and the wind. Wind loading presents the dominant loading which is the biggest regarding magnitude and also time-varying. It generally depends on the wind speed and direction, and on the shape and position of the trackers platform. Currently, there are no codes that would focus directly on the dimensioning of sun trackers steel structure therefor the designers use the codes for steel buildings. Concerning this approach it is the most difficult to determine precisely enough the wind loads on the tracker’s platform, when the platform is tilted for certain angels and when the wind blows from certain directions. The same problems are noted even when the platform is in a stormy position, parallel to the ground/parallel to the direction of the wind. Because the codes do not contain appropriate solution for all positions of the solar panels a large number of scientific articles, which simulate the effects of wind onto the inclined platforms, separated from the ground is noticed. In the most cases the studies of stationary-mounted solar platforms (which do not follow the movement of the sun) are introduced. These results can be used for the determination of the loading of the solar tracker to. Bigger issue is that the simulations are as a rule made ​​only for wind directions parallel to the rows of the platforms in the field and not for the other directions of the wind where the platforms, which are in the first case hidden behind the others can become directly exposed to the wind. There are also no analyses of the potential impact of vortices formed at the edges of one platform to the loading of the neighbourhood platforms. The research is currently very topical and needs high computing power. how to extract, review and present the results of simulations. Basics of Mathematics and Mechanics. Experiences in 3D modelling. Experiences with a software for finite elements method, finite volumes or other similar numerical method. Experiences with Unix or Linux operation system; experiences with ANSYS Structural, CFX and Fluent; experiences in visualization. Bitsuamlak, G., Stathopoulos, T., and Bédard, C. (2004). “Numerical Evaluation of Wind Flow over Complex Terrain: Review.” J. Aerosp. Eng., 17(4), 135-145. Bert Blockena, Ted Stathopoulosb, Jan Carmelieta. 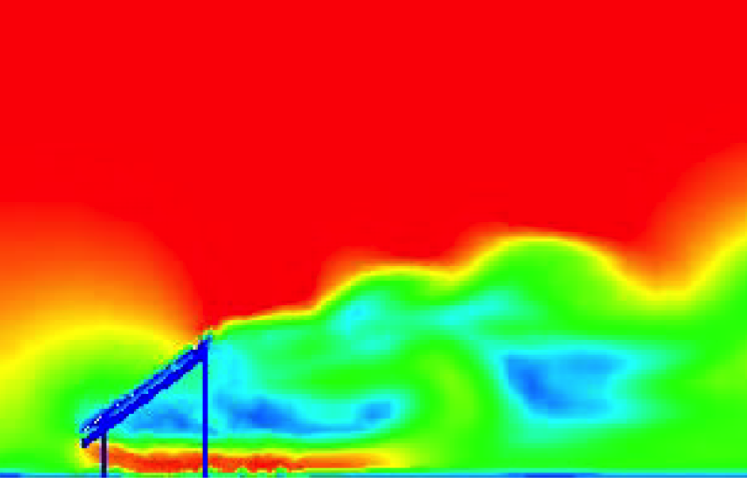 CFD simulation of the atmospheric boundary layer: wall function problems. Atmospheric Environment. Volume 41, Issue 2, January 2007, Pages 238-252.